Put simply, he is accused of playing a part in the killing of 8,000 men at Srebrenica, sniping civilians during the siege of Sarajevo, and ethnic cleansing of non-Serbs. But… despite the gravity of these charges, is the death penalty really needed? Is the death penalty justice? 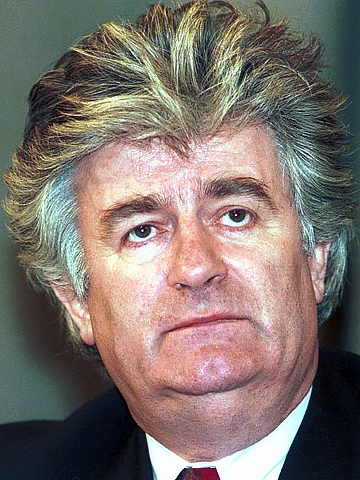 Look at Karadzic’s mentor, Slobodan Milosevic. After delaying the trial for five years, Milosevic dies of heart failure. Asumming that Milosevic was guilty of the charges against him, the end (his death) was the same as if he had been executed. But could this be considered justice? Somehow, I think that those Bosniaks and other victims of the atrocities would argue no – they would want to see him declared guilty. So I think it is reasonable to assume that the justice is found, not in the death of the guilty, but in the declaration of the guilt. That said, there must be punishment that follows. But how does this mesh with our guilt before God? See, I can say quite easily that before God, I deserve to die for my actions. Yet I am less comfortable with the statement that Karadzic deserves to die (here and now) for his. I suppose the difference lies in the fact that God’s justice is perfect, while ours is limited. If Karadzic is innocent, then executing him mistakenly is a bit hard to reverse, while a life sentence can be cut short. However, this seems to be a more practical answer rather than addressing the specific problem of the death penalty being right or not.